Outside my Window... it is smoky and still smells like skunk. I'll be keeping the windows closed today! I am thinking... about the movie Albert & Victoria . I just finished watching it, and I really enjoyed it. From the learning room... lots of angel and rose crafts this week. The girls will be continuing "A" week and learning about Colors and Angels with Little Saints. I am thankful... that hubby is coming home this morning!!!! They released him a few days early, and we will actually be able to have dinner as a family tonight for the first time in 18 days. From the kitchen... Gaufres with Blackberry Jam for breakfast, leftovers for lunch, and a big feast for dinner including Apple Chicken, Steamed Carrots, Garlic Angel Hair Pasta and Sparkling Apple Cider, followed by Devil's Food Cupcakes for dessert. I am creating...plans for the feast of St. Therese. I am going... to try and get caught up on sleep now that hubby will be home. I am reading... all the great posts shared in this weeks From Thy Bounty Fair: Feasting with the Angels. I am so excited that Catholic Cuisine has been such a success and is turning into such a wonderful resource thanks to all the great contributors. I am hoping... that I don't get too sick.. I am coming down with a sore throat, and have a mild fever. I better start loading up on the Vitamins. I am hearing... the children playing St. Michael in the other room. Dressed up with wings and swords and all! They are having a blast! Around the house... Roses from hubby in the living room and a vase of Michaelmas Daisies on the kitchen table. One of my favorite things... Fresh cut Flowers! The tutor is only coming today, and then we are taking the rest of the week off. We'll still be doing school, but a light load for the week, so we can enjoy hubby's days off. Celebrate the feast of St. Therese! Celebrate our 9th Anniversary and the Feast of the Holy Guardian Angels! It took me all day to get around to finishing this post, a few seconds at a time! :) To see more Daybook entry's, click here. Oh, Happy Anniversary!!! Sounds like your husband will be home in time for your anniversary? I hope so!! Many blessings to you both! I know.. I was scared to death that he was going to spray me.. It looks like he was getting ready to. 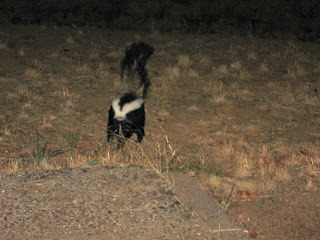 Way to conquer the skunk! Glad to hear your husband is coming home!